That's a lot of diet coke!! 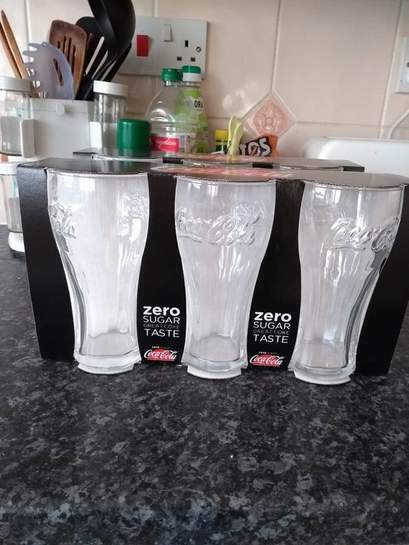 Is it online as can't see anything about free glasses..
25p a can a Tesco. Heat added though. Thank you @gill_conway and welcome to HUKD. I've pushed this onto the Highlights page as it's such a good offer. Please be careful with the glasses, they’re very weak glass-I know someone that completely sliced their hand open whilst washing one. Also, unless you own a pub, who even wants these glasses ! Do they come with glasses? Please be careful with the glasses, they’re very weak glass-I know someone …Please be careful with the glasses, they’re very weak glass-I know someone that completely sliced their hand open whilst washing one.Also, unless you own a pub, who even wants these glasses ! These are £6 for 24 at Tesco. Bargain if you want to drink chemicals. ...unless you want to glass someone. Full fat Cole is also £7 time to stock up. Yea, it's full of DHMO! How can over 29p a can be a good deal? This is a con. People are effectively buying the glasses and not getting them free. No, grateful for the link - i need to re-up tomorrow and if this is available in store then i'll certainly be going to Iceland. These are old glasses that were on offer about 8 weeks ago, if not longer. Free glasses with every 24 pack. There is a new offer coming soon, you'll get x1 glasse with every 24 pack which is related. aren't farmfoods in smaller packs? Deal posting newbie! This is gill_conway first deal post. Help out by leaving a posting tip or just to show your appreciation for their contribution.